Warning: Some spoilers for this book and previous ones in the series. Head back to the Realms of the Black Jewels and become immersed once again in the world of the Blood. Four novellas take moments of time through the lives of Janelle, Daemon, Lucivar, Surreal and Saetan as they continue to live their extraordinary, ordinary lives. For anyone who has read Anne Bishop's Black Jewels series, these four stories are amazingly heart-wrenching. Each book takes a period of time among the previous books, and while the cast of characters remains the same, what happens is enough to shake the Realms. Winsol Gifts starts not long after Dreams Made Flesh, with Janelle still recovering from her transformative purging of the Realms, and Daemon starting to learn how much of his father's mirror he truly is. Shades of Honor takes up after Tangled Webs. As Surreal and Rainier have survived the spooky house that left so many children dead, Lucivar takes them back to Ebon Rih to begin to heal the physical wounds left on both of them. However, with Falonar still living close by, Surreal finds she has more poison still lurking in her body and in her heart. Family brings back a favorite of mine: Sylvia. Death strikes too close, and a child predator is discovered to be roaming Little Terrielle. The family races to catch him before he strikes again, and bring a retribution that only a witch know how to offer. The High Lord's Daughter finds us jumping through decades in the future. As Daemon finds himself lost without those who anchored him, can a new dream find a way to spin its web around his heart? First off, I am a complete fangirl when it comes to Anne Bishop and her books, so needless to say I loved this one as much as the others. I cannot say that where these books have led to surprises me that much. I have heard grumblings from those who were shocked, especially by The High Lord's Daughter, but it was established from the beginning that Daemon has been around for over 1700 years, has centuries more to go, and Janelle would live a "normal" lifespan. Clues were planted by Bishop through previous books, like Dreams Made Flesh and Tangled Webs. As hard as it is to see beloved characters die, as some did in these novellas, stories eventually come to an end. While mostly chronological, the previous books still left enough unanswered questions at times to present the stories here in Twilight's Dawn. Bishop has a masterful way with world-building and introducing plot lines that carry through more than one book. None were done in a hurried and trite way, either. The pain that Surreal and Rainier suffered in Tangled Webs was started on the road to healing in Shades of Honor, but details from there still carried through decades later to The High Lord's Daughter. The stark beauty of the Realms has always captured me: from the superficial Terrielle to strong, wild Kaleer to the untamed depths of Hell. There were witches and Princes and Queens and kindred and demon-dead. There was good and evil and a whole spectrum of choices to dance upon in between. The Realms are an amazing world, and the characters Bishop has created are imperfectly perfect. There is certainly room for secondary stories, as The Shadow Queen and Shalador's Lady brought characters tied, but not central, to the other books. 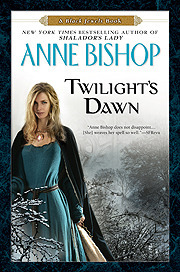 However, Twilight's Dawn feels like an ending to the saga of the Queen of Ebon Askavi, and it was a fitting one.